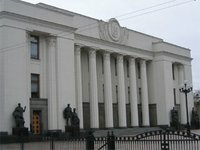 The Verkhovna Rada, Ukraine's parliament, will consider three bills on the treatment of convicts abroad during its next plenary week. The adoption of such a law could facilitate the settlement of the problem of convicted former Ukrainian Prime Minister Yulia Tymoshenko. "I propose to put on agenda of the next plenary week three bills… The committee should be instructed to improve them so that we can consider all of these three bills next plenary week," Verkhovna Rada Chairman Volodymyr Rybak said on Thursday. Some 367 of the 416 parliamentarians registered in the sitting hall supported this initiative. Members of all factions except the Communist Party of Ukraine faction voted for this decision. The parliament will hold its next plenary week on November 5-8.